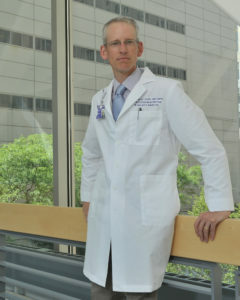 Jeffrey Linder, ’97 MD, MPH, chief of General Internal Medicine and Geriatrics in the Department of Medicine and the Michael A. Gertz Professor of Medicine, was senior author of the study published in JAMA Internal Medicine. Americans with primary care received significantly more high-value healthcare — such as recommended cancer screenings and flu shots — and reported better patient experience and overall healthcare access, compared to those who don’t have primary care, according to a study published in JAMA Internal Medicine. Jeffrey Linder, ’97 MD, MPH, chief of General Internal Medicine and Geriatrics in the Department of Medicine and the Michael A. Gertz Professor of Medicine, was senior author of the study. In the United States, the healthcare system is generally centered around hospitals and specialty care. The value of primary care, however, has remained unclear and debated, in part due to limited research. The current study is the first to directly compare the quality and experience of outpatient care between adults with or without primary care. Importantly, the investigators adjusted their analysis to compare Americans of similar health status, demographics and other factors. In the study, the investigators analyzed data from a nationally-representative survey of the U.S. population. Respondents were considered to have primary care only if they had a “usual source of care” — i.e., a health professional they usually go to when sick or in need of health advice — that also met the four “C’s” of primary care: First Contact, Comprehensive, Continuous and Coordinated. The investigators then applied a statistical technique to control for potential confounding factors — such as socioeconomic status, physical and mental health — in order to make comparisons between virtually equivalent patients. The investigators found that even though all respondents received a similar amount of care, Americans with primary care received significantly more “high-value” services — such as recommended cancer screenings, diagnostic and preventive testing, diabetes care and counseling. Those with primary care also reported better healthcare access and experience, compared to those without. However, patients with primary care were also slightly more likely to receive low-value care, in particular, unnecessary antibiotics. “We have further work to do to optimize the amount of high-value care and minimize the amount of low-value care we are delivering to patients,” Linder said. Overall, the authors concluded that policymakers and health system leaders seeking to increase value should consider increasing investments in primary care. “This study provides clear evidence for why America needs more primary care,” said first author David Levine, MD, MPH, MA, a general internist and Instructor in Medicine at Brigham and Women’s Hospital and Harvard Medical School.